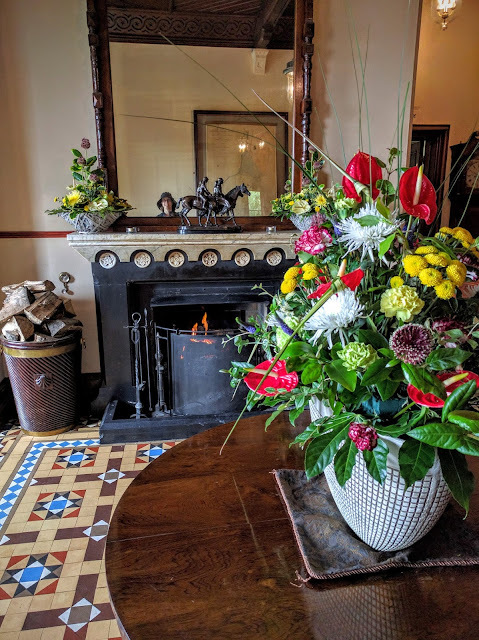 We wanted to do something special for my birthday this summer but decided to do a 'staycation' in Ireland rather than traveling abroad. 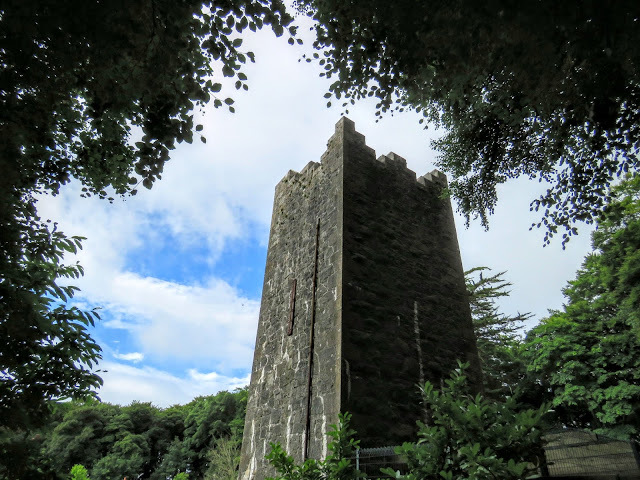 We settled on a long weekend in County Sligo and North County Mayo in the West of Ireland along the Wild Atlantic Way for our adventure. We signed up to do a hawk walk at Mount Falcon Estate just outside of Ballina in County Mayo. As we drove up to Mount Falcon, it felt as if we were taking a step back in time to learn the ancient art of falconry. Mount Falcon is an aptly named grand old stone manor house in Northern County Mayo. Even though we were visiting in August, a cozy fire was crackling in the corner of the lobby. A giant portrait of a hawk adorned the impressive central staircase. What an amazing place to spend the night for my birthday! 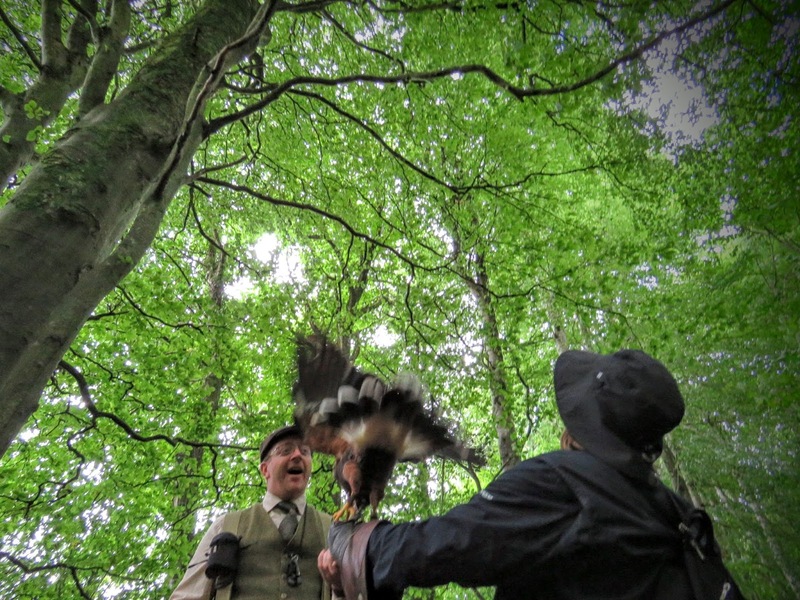 The absolute highlight of our stay at Mount Falcon was our morning hawk walk with Jason Deasy, a professional falconer. 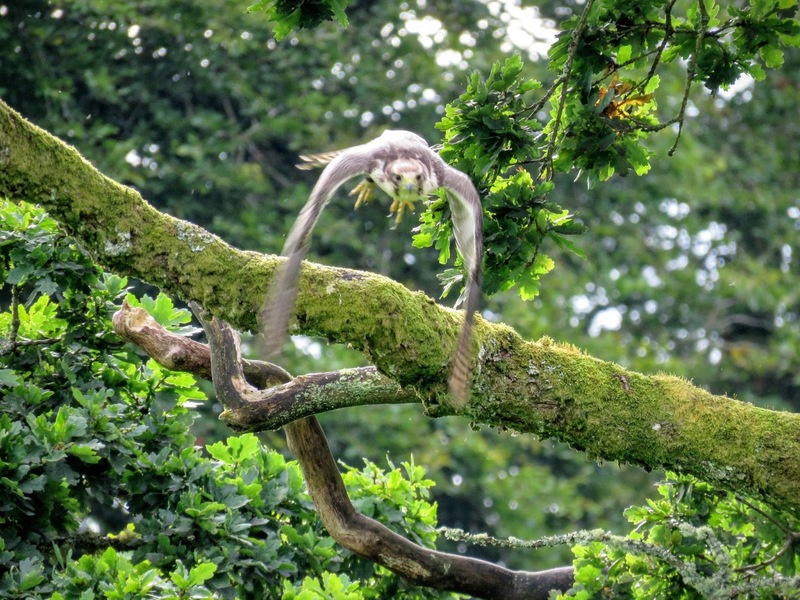 As we stepped out of the lobby, we spotted a falcon spreading its wings in the tree above us and watched in awe as Jason expertly 'flew' the bird. 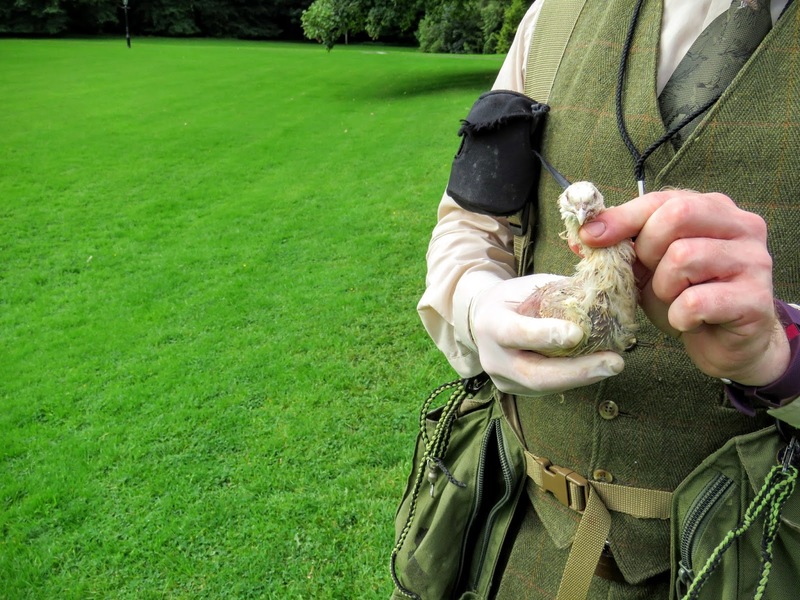 Practising the thousands year old art of falconry, Jason exercised the bird making it swoop in again and again in pursuit of a freshly killed chick connected to a swinging cord. The early bird catches the worm, or in the case of our morning hawk walk, the early bird gets his breakfast. We watched the hawk land and go to town on the freshly killed chick, watching its surroundings with an eagle eye as it ate. With the falcon safely perched on his arm, Jason led us to the falconry. The falconry had great atmosphere and was anchored by an old stone tower. 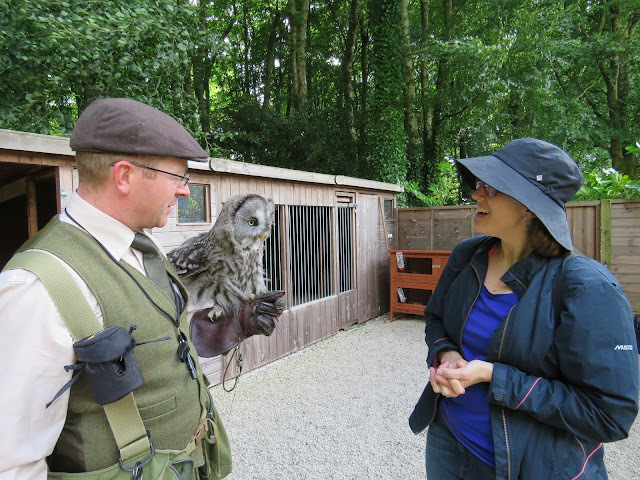 We stepped through the gate and were pleased to make the acquaintance of several of Mount Falcon's birds of prey including Oisin the Barn Owl. 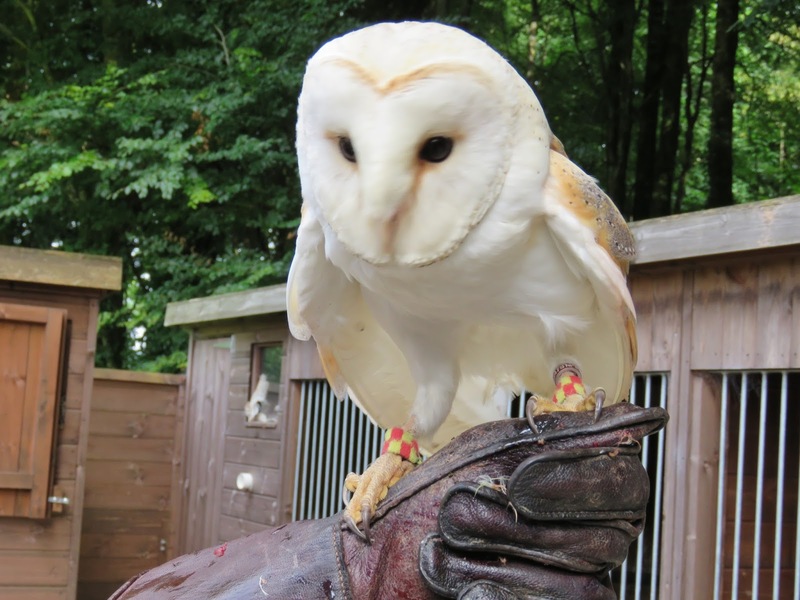 Barn owls are now endangered in Ireland with only 200 pairs left in the wild due to misuse of rodenticide. You can tell by the color of an owl's eyes whether they are diurnal, nocturnal, or somewhere in between. Dark eyes (like those of a barn owl) indicate the bird of prey is nocturnal. Bright yellow eyes are diurnal and orange eyes mean the bird hunts at dusk and dawn. 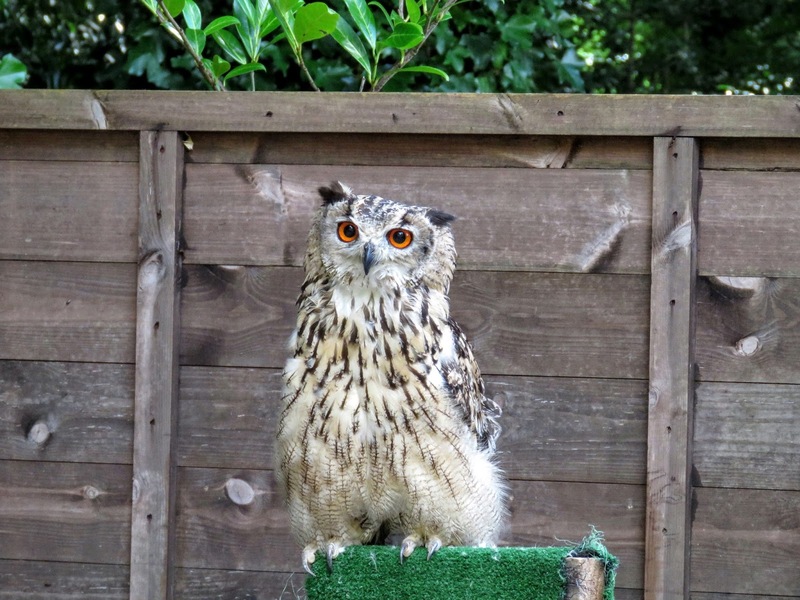 We watched with great interest as Jason brought out one of his eagle owls. There are Indian and European species that differ by size. Our falconer guide weighed the eagle owl and then called it to his arm. The wing span was impressive. 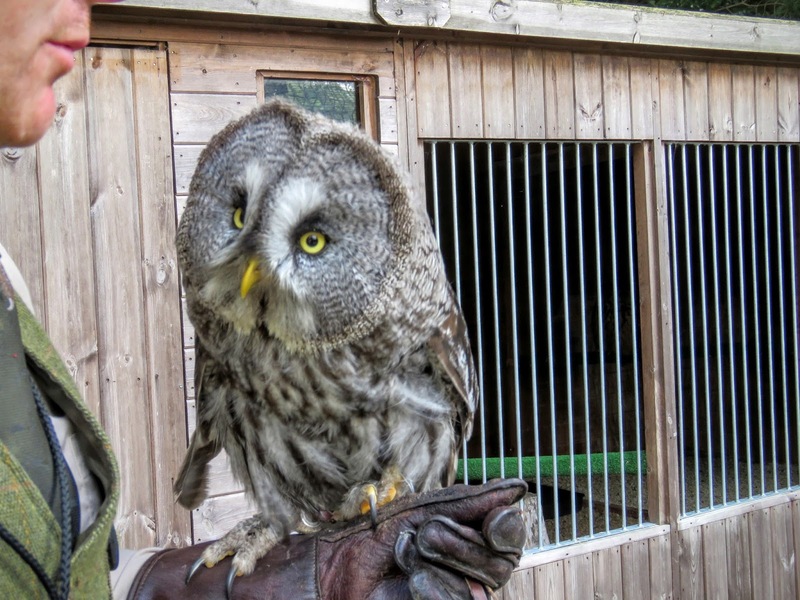 My favorite resident of Mount Falcon's falconry was definitely Gandalf, the Great Grey Owl. The way Gandalf inquisitively looked at everything and everyone (including me!) was simply charming and disarming. Apparently, no hawk walk is complete without a dog to accompany you on the journey. 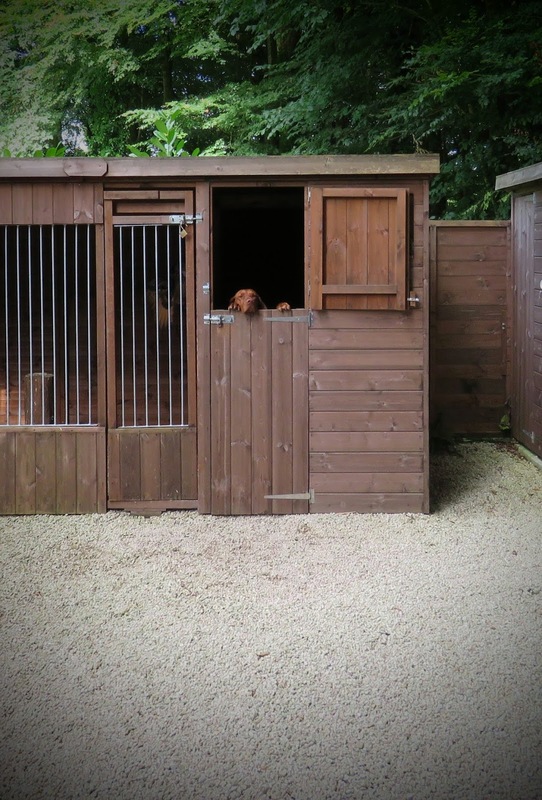 We spotted Chili peeking out at us longingly from his corner of the falconry. 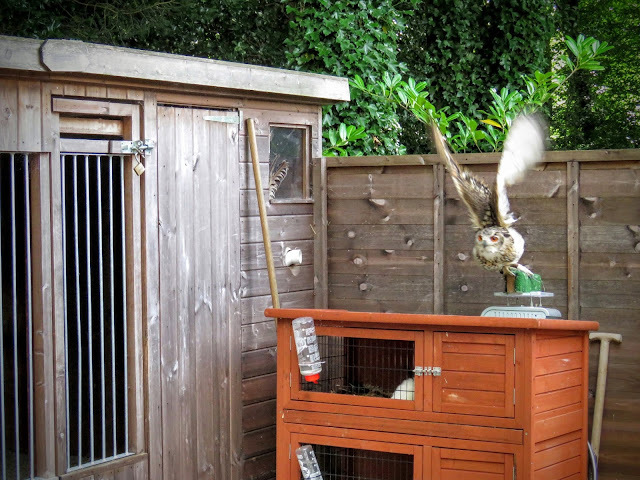 Jason sagely pointed out that dogs need to know their place in the falconry. If you let them think they are too important, they'll rule the roost. After strategically ignoring Chili for a while, Jason finally let him out. 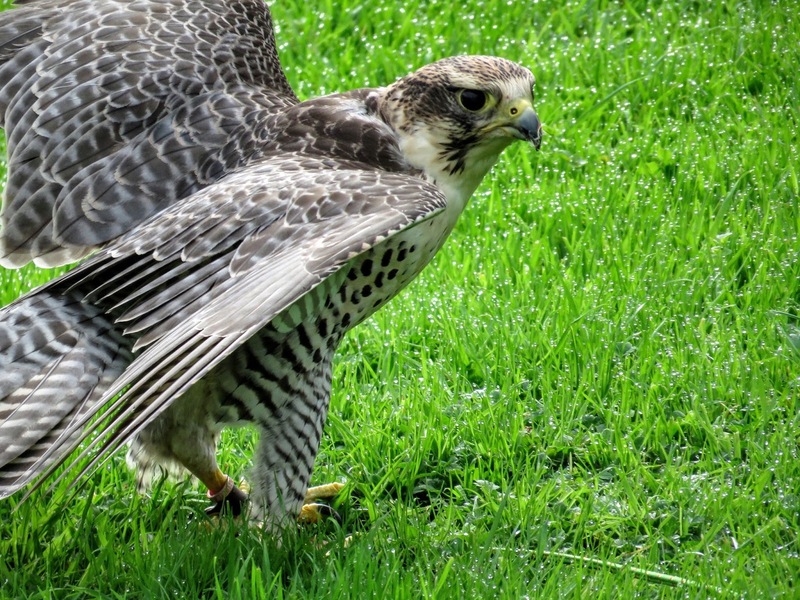 Chili brought up the rear as our procession left the falconry and proceeded through the forests of County Mayo on the grounds of Mount Falcon. 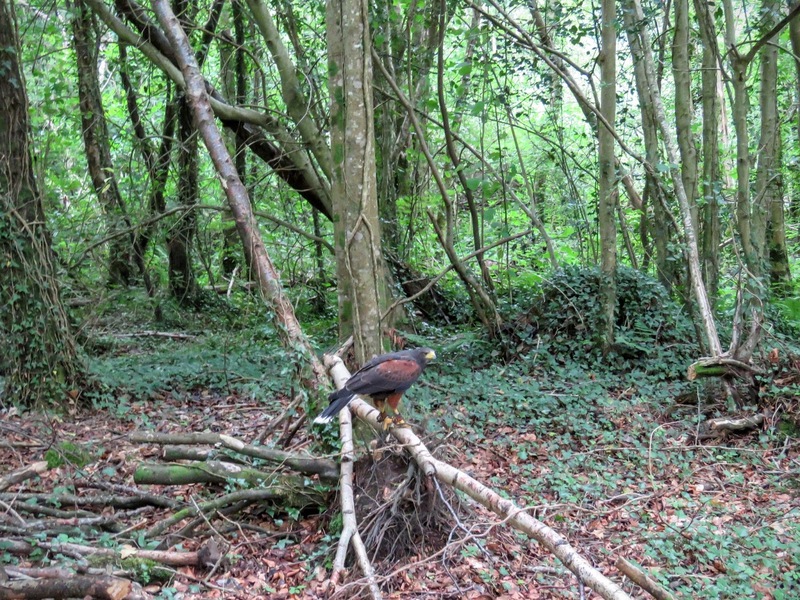 The star of our hawk walk at Mount Falcon was a Harris Hawk. Hailing from North America, harris hawks have the perfect disposition for a falconry tour like this. They are predictable social hawks. I donned a thick leather glove and Jason popped a bit of chicken between my fingers. 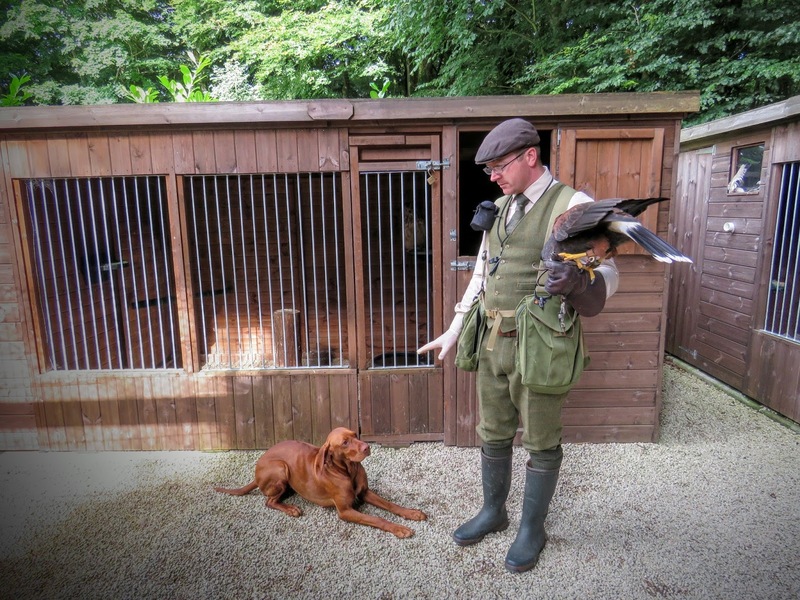 I raised my arm and the Harris Hawk alit there. Apparently, I'd made a new friend (as long as the food was forthcoming!). We strolled through the shadowy forest. 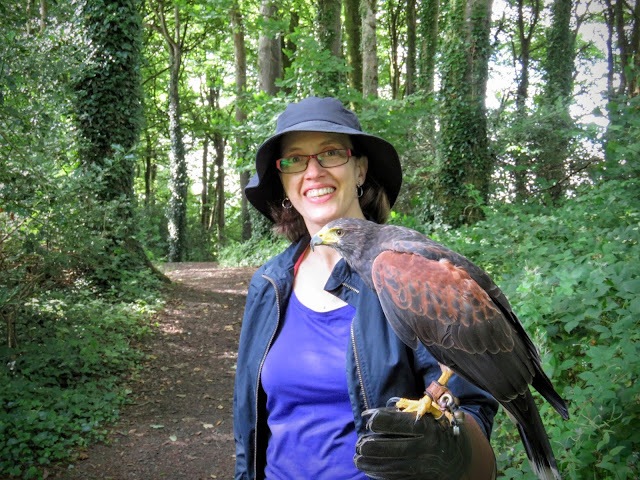 I couldn't believe we were practicing the ancient art of falconry in the West of Ireland. 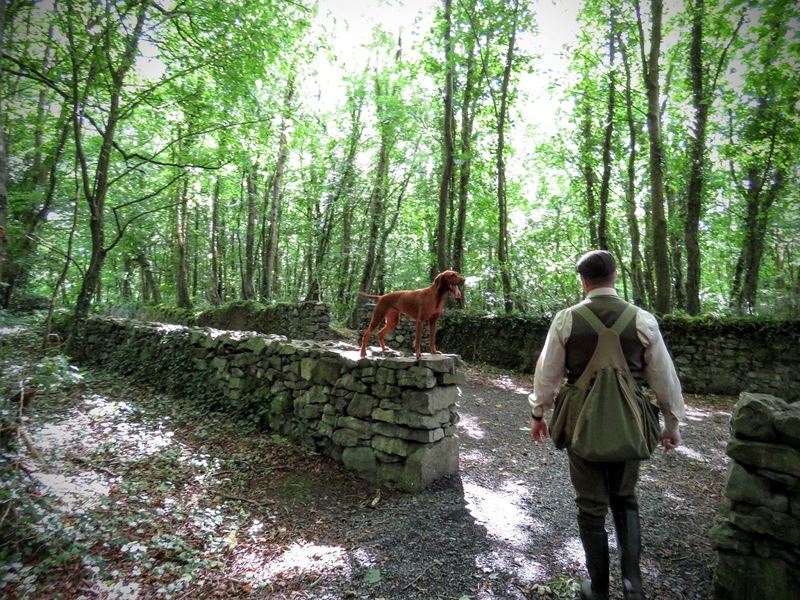 Chili would jump onto stone walls in the forest and point out the way. On the hawk walk, our accompanying bird of prey alternated between flying through the forest and alighting on our arm. Each person on the tour gets to don the glove and walk with the hawk perched there. We were super fortunate. While tours can grow to up to 20 people, our tour was bright and early on a Saturday and it was just the two of us (my husband and me) on a private hawk walk. Our hawk walk tour at Mount Falcon lasted about 90 minutes. 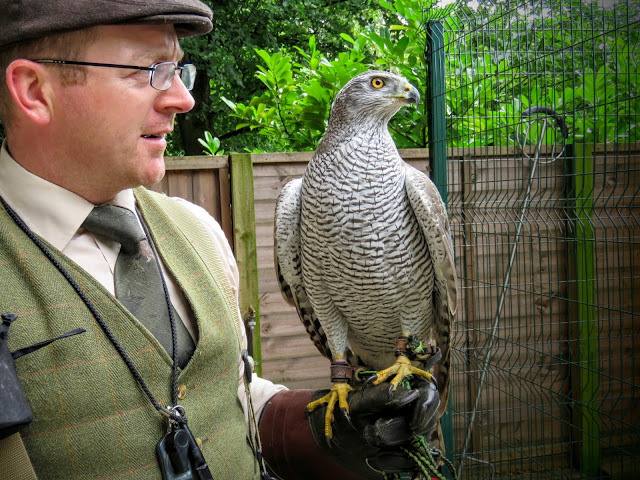 We ended up back at the falconry for an encounter with a Goshawk. What a large and impressive hawk! Jason even gave me a goshawk feather to take home. I feel like I should turn it into a quill and dip it in ink to write about this trip rather than typing away on my computer. 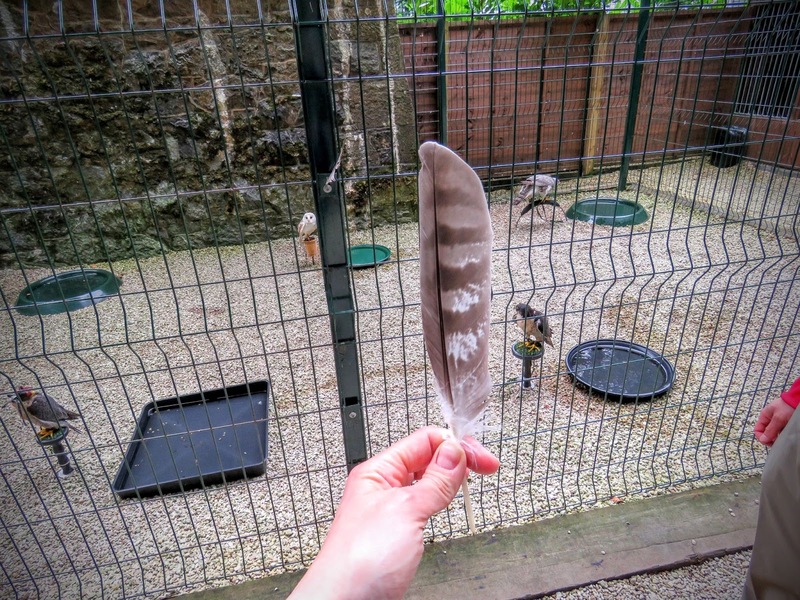 Experiencing the ancient art of falconry was the perfect birthday gift on a long weekend road trip in County Sligo and County Mayo in the west of Ireland. The hawk walk at Mount Falcon Estate cost 150 EUR per couple at the time of writing. 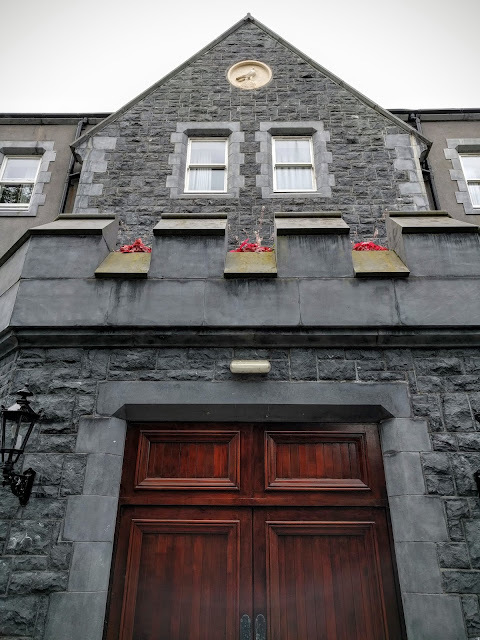 The price may be discounted for those staying on the property as part of an accommodation package. 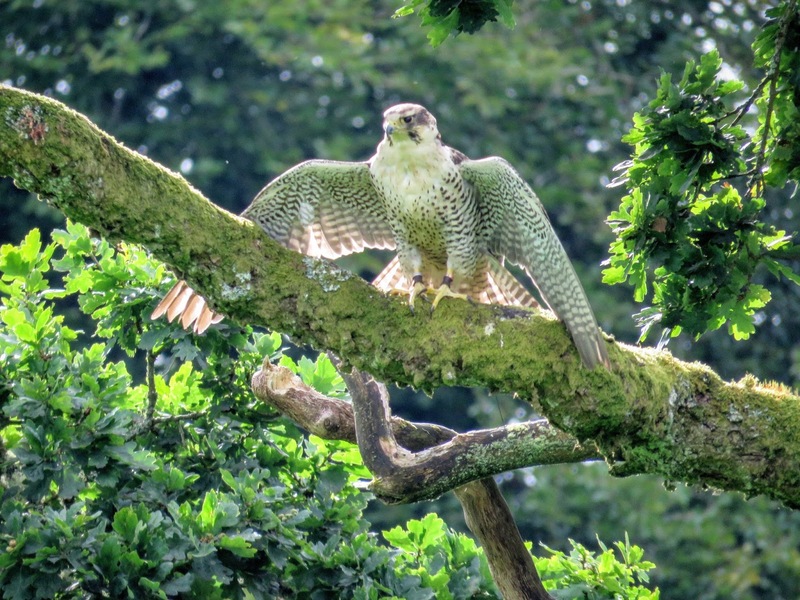 Learn about the ancient art of falconry while exploring the grounds of Mount Falcon Estate on a hawk walk in County Mayo, Ireland. A photo-rich post by travel blogger Jennifer, aka Dr. J, from Sidewalk Safari.